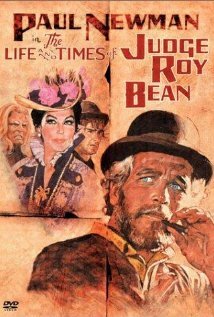 The Life and Times of Judge Roy Bean: Hollywood fact or fiction? LET’S GO BACK to the Wild West (remember Wild Bill Hickok, Buffalo Bill of previous posts?) and meet Judge Roy Bean. The 1972 film starring Paul Newman in the lead and Ava Gardner as Lillie Langtry, is, shall we say, very loosely based on the facts and leave it at that. So, who was Judge Roy Bean? What of his past? Well, he was born in 1825 in Mason County, Kentucky. At the age of 16 he was obliged to flee to San Antonio in Texas (those of you who read my post on The Alamo last august will recognise that name) and joined his brother, Sam, hauling freight. By 1848, he and Sam had set up a trading post in Chihuahua in New Mexico, but Roy was forced to flee again after shooting and killing a Mexican desperado. He ended up with another brother, Joshua, who had been elected mayor of San Diego in California in 1850. All was well until he had a disagreement with a Scotsman named Collins in 1852. The latter challenged Bean to a pistol-shooting match on horseback and gave Bean the option of targets. Bean chose to shoot at each other. Well, why not! Bean won the contest by wounding Collins in the arm but was arrested for assault with intent to murder. Bean escaped incarceration in April and ended up in San Gabriel, still in California, as a bartender in a saloon owned by brother Joshua. In November, Joshua was murdered and Roy inherited the saloon. In 1854, Bean’s girlfriend was kidnapped and forcibly married to a Mexican officer. Bean tracked him down and challenged him to a duel and killed him. The officer’s colleagues captured Bean and left him on his horse with a noose around his neck. The horse failed to bolt and Bean’s ‘no longer-kidnapped’ girlfriend cut him free. He was left with a permanent rope burn on his neck and a permanent stiff neck – think himself lucky! 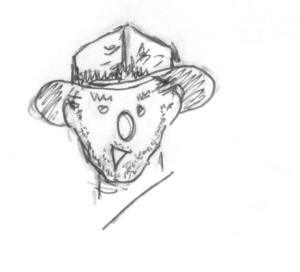 Bean had had enough of California – not proving so lucky – and headed to New Mexico and brother Sam again who had been appointed the first sheriff of Dona Ana County. By 1861 they both ran a store and saloon in Pinos Altos. However, they were then interrupted by the Civil War. Roy joined the Confederates and ran a blockade by hauling cotton from San Antonio to British ships off the coast at Matamoros, then returning with supplies. After the war he remained in San Antonio for the next 20 years working as a teamster in haulage. He combined this work with other activities not entirely legal or successful (he tried a dairy business but watered down the milk; he tried a butchers’ business by rustling stock – you get the idea). By the late 1870s he was running a saloon in Beanville (don’t ask) but this wasn’t to last – he was paid to leave (well, bought out for $900) by a disgruntled store-owner who did not approve of his unscrupulous activities. Come 1882 he had purchased a tent by the Pecos River (still New Mexico) and set up a saloon for the railroaders. He called the bar the Vinegaroon. This was untamed territory and the nearest court was at Fort Stockton, some 200 miles (320km) away. Then, in August 1882, he was approached by a Texas Ranger to set up a courthouse and introduce some law and order. This ominous task he accepted and he was ‘appointed’ (perhaps better described as self-appointed) justice of the peace for the new Precinct 6 in Pecos County, and, along with his one and only law book, the 1879 edition of the Revised Statutes of Texas , he did, indeed, deal out justice – of a kind – and called himself ‘The Law West of the Pecos’. I always thought he had a bit of a reputation as a hanging judge . In fact this was not so at all. It appears that he only ever sentenced two men to hanging and one of them escaped. The death penalty was standard for horse thieves but Bean let them go provided they returned the horse . Anyway, trials were always good for business as he insisted all jurors (chosen from his best customers) bought drinks during a court recess. On a legal technicality note, a saloon-owner competitor of Bean’s sold land at Langtry (as it was to be called) to the railway with a contractual term that no land was to be sold or leased to Bean. Bean got around this by setting up his saloon tent (he called the Jersey Lilly after Lillie Langtry) on a railway right-of-way not covered by the contract, and here he squatted for the next two decades. This legal loop-hole was not of his own discovery but by an Irishman, Paddy O’Rourke, who was repaying Bean for freeing him after he had murdered a migrant worker. 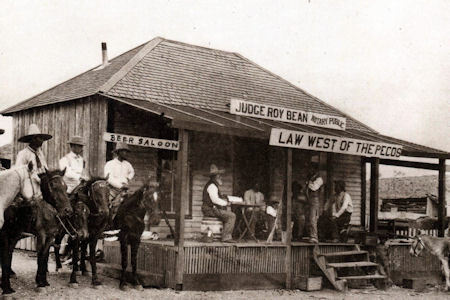 Jersey Lilly Saloon, Judge Roy Bean holding court in 1900. Bean is in the centre of the photograph, wearing hat, sitting on a barrel and holding open his law book. There was no jail in Langtry so Bean only ever fined culprits, the money he kept for himself. He calculated some amounts of fines based on how much the defendant had in his pocket at the time. His court did not have the power to grant divorces but this minor detail did not stop Bean. He would charge $10 for a divorce and again pocket the’ fee’, along with $5 for weddings. I wonder if he ever offered a package deal? The saloon is still there today! Bean won re-election to his post in 1884, but was defeated in 1886. The following year, the commissioner’s court created a new precinct in the county and appointed Bean to be the new justice of the peace. He continued to be elected until 1896. Even after that defeat, he refused to surrender his seal and law book and continued to try all cases that suited him in his own ‘precinct’. It’s not quite clear what the justice who was elected was doing. In March 1903, after a bout of heavy drinking in San Antonio, he died peacefully in his bed, aged 77-78. Could have been worse ….. When newer law books showed up, Bean used them as kindling. The real so-called ‘hanging judge’ was a Welshman called George Jeffreys, 1st Baron Jeffreys of Wem (1645-89). Reminds me of the Artemus Smith extract from 28th July 2014 post (following ‘House of the Virgin Mary)! ‘When NASA first started sending up astronauts, they quickly discovered that ball-point pens would not work in zero gravity.